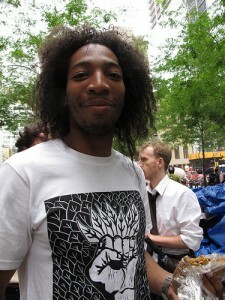 Occupy Wall Street protester Shawn "Hero" Vincent, 21, is a public relations facilitator for the Occupy Wall Street protest in Lower Manhattan's Zuccotti Park. Photo by Louie Lazar. 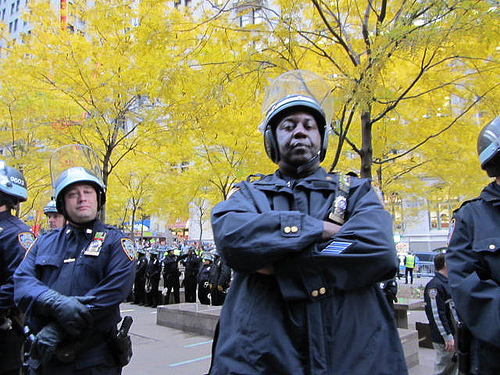 Shawn “Hero” Vincent is an important man these days within Zuccotti Park, the block-long rectangular plaza in Lower Manhattan that, boxed in by skyscrapers and dark uniformed police, feels like the bottom of an urban canyon. A tall 21-year-old with wild and frizzy black hair, Vincent could barely move a few steps yesterday without someone shouting out “Hero!” or being the recipient of a ferocious high-five. “It’s an incredible feeling,” said a beaming Vincent of his sudden rock-star status inside ‘Liberty Square,’ as his fellow protesters have dubbed the park. 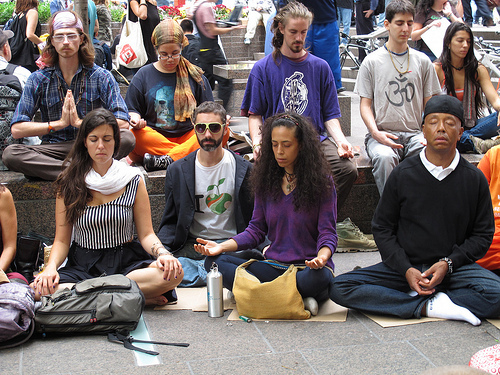 Vincent has emerged as a leader among “Occupy Wall Street” activists, a ragtag civilian army that seized control of this territory September 13 to protest U.S. financial system inequality, among other progressive causes. Several hundred protesters camp out here every night. Within moments, however, Hero re-emerged at the center of a media frenzy, smiling for a TV crew, and standing alongside Russell Simmons, the business magnate who came here to show his support. For the next half-hour or so, the two walked around together and chatted like long-time pals; every so often, Simmons could be seen slapping Vincent on the back. For many protesters like Vincent, the past two weeks here have been life changing. The responsibilities they’ve taken on, and the human connections they’ve made, have injected them with hope, filled life voids, and even erased boredom. One volunteer in dire need of a morale boost was Steve Smith, 24, who has been seeking employment for the past two months. At Liberty Square, people rely on Smith. A trained first responder, Smith volunteers at the medical station, administering basic first aid and handing out vitamins to depleted protesters. Some volunteers are unemployed, but others, like 24-year-old graphic and web designer Drew Hornbein, have full-time jobs. Hornbein earns approximately $60,000 a year working out of his Crown Heights, Brooklyn brownstone. Every day, Hornbein rides his bike here over the Brooklyn Bridge, then tries to nab a seat at the media center, a series of granite benches on the park’s east end where tech-savvy “occupiers” stare at laptops and help beam the park’s happenings worldwide. 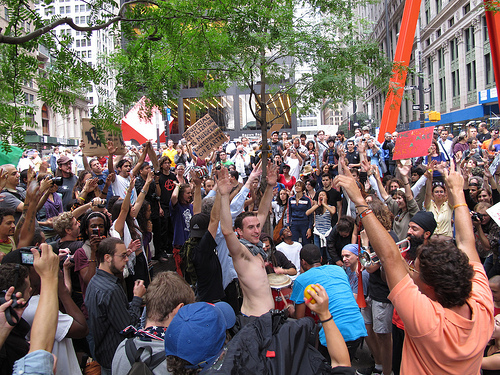 Sometimes, Hornbein stays here until 3 or 4 a.m.
A crowd of Occupy Wall Street protesters cheer during a musical session in Lower Manhattan's Zuccotti Park. Photo by Louie Lazar. At dusk, a festive vibe overtook the park: a saxophone and drum-led jamming circle, accompanied by sporadic yelps of joy, echoed from the park’s western edge. Chants broke out. There was a repeated whistle blowing, as if this were the inside of a dance club.